Ernst Heinrich Philipp August Haeckel (February 16, 1834 — August 9, 1919), also written von Haeckel, was an eminent German biologist, naturalist, philosopher, physician, professor and "fantastic artist". Ernst Haeckel named thousands of new species, mapped a genealogical tree relating all life forms, and coined many terms in biology, including phylum, phylogeny, ecology and the kingdom Protista (details below). Haeckel promoted Charles Darwin's work in Germany and developed the controversial "recapitulation theory" claiming that an individual organism's biological development, or ontogeny, parallels and summarizes its species' entire evolutionary development, or phylogeny: "ontogeny recapitulates phylogeny". 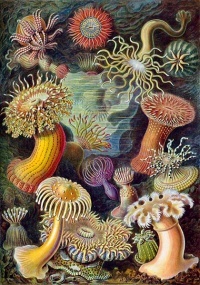 The published artwork of Haeckel includes over 100 detailed, multi-color illustrations of animals and sea creatures (see: Kunstformen der Natur, "Artforms of Nature"). As a philosopher, Ernst Haeckel wrote Die Welträthsel (1895-1899, in English, The Riddle of the Universe, 1901), the genesis for the term "world riddle" (Welträthsel); and Freedom in Science and Teaching (1877, English 1879, ISBN 1-4102-1175-4) to support teaching evolution. Haeckel's entire literary output was extensive, working as a professor at the University of Jena for 47 years, and even at the time of the celebration of his 60th birthday at Jena in 1894, Haeckel had produced 42 works with nearly 13,000 pages, besides numerous scientific memoirs and illustrations. Unless indicated otherwise, the text in this article is either based on Wikipedia article "Ernst Haeckel" or another language Wikipedia page thereof used under the terms of the GNU Free Documentation License; or on original research by Jahsonic and friends. See Art and Popular Culture's copyright notice. This page was last modified 12:01, 21 December 2014.